4 June/July 2018 unmanned systems inside Editorial Mission: Inside Unmanned Systems provides actionable business intelligence to decision-makers and infl uencers operating within the dynamic global UAS community. Analysis of key technologies, independent reports on the latest policy and regulatory developments, and evaluation of new product designs and applications support the results stakeholders need to succeed across the commercial, civil and defense sectors. Publishing Team PUBLISHER Richard Fischer richard@insideunmannedsystems.com SALES MANAGER Debbie Duhn debbie@insideunmannedsystems.com DIRECTOR of MARKETING Christine Waring christine@insideunmannedsystems.com EDITOR Dee Ann Divis deeann@insideunmannedsystems.com MANAGING EDITOR Stan Goff stan@insideunmannedsystems.com SENIOR EDITOR Renee Knight renee@insideunmannedsystems.com EUROPEAN EDITOR Peter Gutierrez peter@insidegnss.com TECHNOLOGY EDITOR Charles Q. Choi CONTRIBUTING EDITORS General James Poss (Ret. ), Vicki Speed WEBMASTER Richard Thomas CIRCULATION DIRECTOR Jan Edwards-Pullin unmanned systems.com INSIDE ENGINEERING, POLICY AND PRACTICE inside christine@insideunmannedsystems.com stems.com PUBLISHED BY AUTONOMOUS MEDIA, LLC MANAGING DIRECTOR Richard Fischer richard@insideunmannedsystems.com Autonomous Media 157 Broad Street, Suite 318 Red Bank NJ 07701 USA Telephone: 609-240-1590 Copyright 2018 Autonomous Media LLC. All rights reserved. No part of this publication may be reproduced or transmitted in any form or by any means, electronic or mechanical (including by Internet, photocopy, recording, or information storage and retrieval), without permission in writing from Autonomous Media. Authorization is granted to photocopy items, with attribution, for internal/educational or personal non-commercial use. For all other uses, contact Richard Fischer. 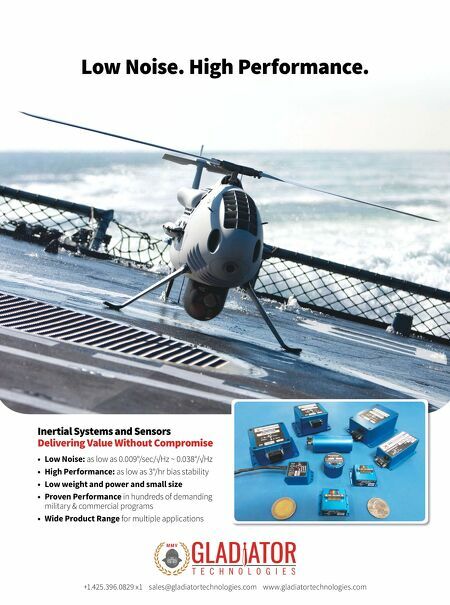 INSIDE UNMANNED SYSTEMS is a controlled circulation magazine, published 6 times a year. Postage paid at Lebanon Junction MPO, KY 40150-9998, Mail Permit #473. Find News, Digital Editions, White Papers, e-Newsletters, Webinars and Policy Updates Sign up online for your FREE SUBSCRIPTION TODAY! 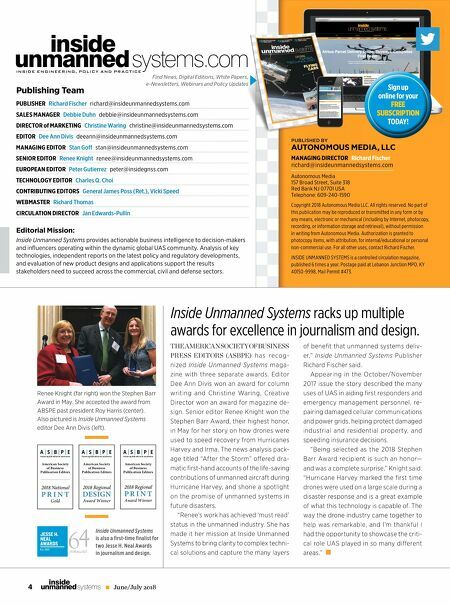 THE AMERICAN SOCIETY OF BUSINESS PRESS EDITORS (ASBPE) has recog- nized Inside Unmanned Systems maga- zine with three separate awards. Editor Dee Ann Divis won an award for column writing and Christine Waring, Creative Director won an award for magazine de- sign. Senior editor Renee Knight won the Stephen Barr Award, their highest honor, in May for her story on how drones were used to speed recovery from Hurricanes Harvey and Irma. The news analysis pack- age titled "After the Storm" off ered dra- matic fi rst-hand accounts of the life-saving contributions of unmanned aircraft during Hurricane Harvey, and shone a spotlight on the promise of unmanned systems in future disasters. "Renee's work has achieved 'must read' status in the unmanned industry. She has made it her mission at Inside Unmanned Systems to bring clarity to complex techni- cal solutions and capture the many layers of benefi t that unmanned systems deliv- er," Inside Unmanned Systems Publisher Richard Fischer said. Appearing in the October/November 2017 issue the story described the many uses of UAS in aiding fi rst responders and emergency management personnel, re- pairing damaged cellular communications and power grids, helping protect damaged industrial and residential property, and speeding insurance decisions. "Being selected as the 2018 Stephen Barr Award recipient is such an honor— and was a complete surprise," Knight said. "Hurricane Harvey marked the fi rst time drones were used on a large scale during a disaster response and is a great example of what this technology is capable of. The way the drone industry came together to help was remarkable, and I'm thankful I had the opportunity to showcase the criti- cal role UAS played in so many diff erent areas." Inside Unmanned Systems racks up multiple awards for excellence in journalism and design. American Society of Business Publication Editors 2018 National P R I N T Gold A | S | B | P | E Fo s tering B 2 B e ditorial e xcellence American Society of Business Publication Editors 2018 Regional DESIGN Award Winner A | S | B | P | E Fo s tering B 2 B e ditorial e xcellence American Society of Business Publication Editors 2018 Regional P R I N T Award Winner A | S | B | P | E Fo s tering B 2 B e ditorial e xcellence Renee Knight (far right) won the Stephen Barr Award in May. She accepted the award from ABSPE past president Roy Harris (center). Also pictured is Inside Unmanned Systems editor Dee Ann Divis (left). Inside Unmanned Systems is also a fi rst-time fi nalist for two Jesse H. Neal Awards in journalism and design.